For the last several years I’ve been predicting the demise of the cupcake trend. But it Just. Won’t. Die. Since moving to L.A. and returning to San Diego a million years ago, cupcakes have seemed to always be the forerunner of food trends. Well let me tell you this: I’m so over it. While my coworkers are still ohhhhing and ahhhhing over cupcakes, I turn up my nose and hope for pie instead. But deep in my heart, I’ve been really waiting for the empanada trend to bloom which is really just pies you can eat with your hands. Since that hasn’t happened just yet, I’m easily satisfied knowing that Papa Luna’s Empanadas is around. 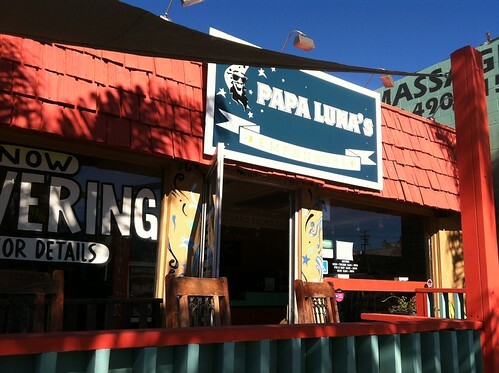 Papa Luna’s is located in Pacific Beach. It originally caught my eye on the way to Trader Joe’s. And like a neon sign (which they don’t have), it was the word empanadas on their sign that lured me in. 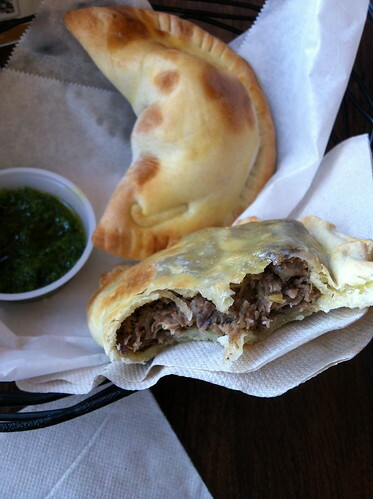 A lit case filled with their empanadas of the day greets you by the counter. 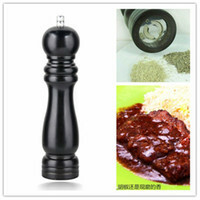 Flavors rotate somewhat on a daily basis with some available all the time. And for the vegetarians, there are several options such as the Thai butternut squash. On the day we visited, there were about 9 varieties available, both savory and sweet. Empanadas are individually priced and the largest price difference is 30 cents. For a better deal, order a half dozen or a dozen, starting at 15.95 for six empanadas of your choice. As much as I would have loved to have tried all varieties, the problem with only two people is stomach capacity and it turns out 6 empanadas is the maximum. The varieties we settled on were short rib, jamon y queso (ham and cheese), three cheese, crab + andouille gumbo, camarones y tocino (shrimp and bacon) and dulce de leche + apple. As you place your order, your selection is picked straight from the case and heated. 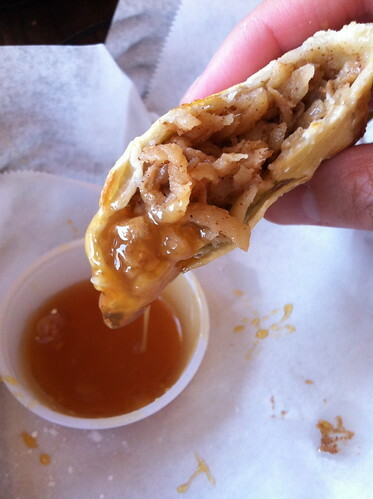 Each order comes served with chimchurri sauce or with a sriracha cream sauce, depending on the empanada. Unless I do a precise dissection at the table, most empanadas look the same from the exterior. Most come in a half moon shape with differing crimps on the edges – something I’m sure is code for the people preparing it. Exceptions to the half moon shape are the three cheese and dulce de leche + apple empanadas, which were overstuffed and could sit standing up on a plate. Think overstuffed gyoza dumplings and you get the idea. Our favorite was the short rib. It was thinner than the other empanadas but stuffed full of shredded meat served with chimchurri; I could hardly detect the parsnip puree. Other standouts were camarones + tocino and jamon y queso with their own unique flavor profiles despite both having pork products. The camarones + tocino was flavored with garlic that tied everything together and dipping it with the sriracha cream sauce added a bit of heat. As for jamon + queso, what could be so wrong about this combo? Papa Luna’s hit the target with this creation. Unfortunately, the three cheese empanada could have used stronger cheese. One of the cheeses, which I suspect was ricotta, was too far too mild. I would have liked to have tasted some spicy. Another disappointment was crab + andouille. It was chock full of rice that it smothered the seafood and sausage included in the ingredient list. 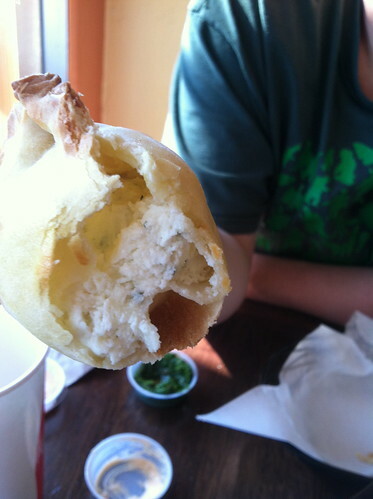 Unless you like carbs stuffed into dough, this empanada was the weakest of our order. Dessert pies are made even better when they’re hand pies. The dulce de leche + apple is tightly stuffed with spiced apples served alongside a caramel sauce. Other dessert empanadas that looked equally tempting were the nutella + banana and guava + cheese. My only criticism about the empanadas was the dough. 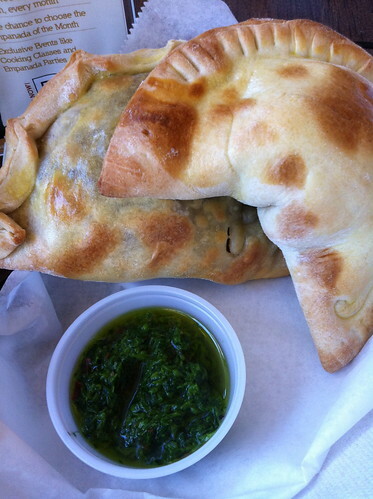 The empanadas are baked, not fried… which is healthier but it leaves the texture flat. It’s not enough to break off my love affair of these, but it’s noticeable that something was off especially compared with empanadas I’ve had in the past. Since man cannot live on empanadas alone, French fries, salad and plantain chips are also available. Papa Luna’s is open until 2 a.m on Fridays and Saturdays — a great incentive for the PB bar crowd to check it out. And maybe, just maybe I’ll try the rest of the menu which includes a turkey dinner empanada complete with cranberry sauce. I am still waiting for a pie truck. It would be so delicious! We saw a pie “food pod” when we were in Portland and I was in heaven. An empanada truck would also be pretty cool. OMG, we were just there! In fact I’m working on my post, haha! You guys tried twice as many flavors as us. I agree about the dough. It would taste so much better fried, but I guess ‘baked’ is healthier. @Leanne – the pie food cart you are refererring to was Whiffie’s Fried Pies at the Cartopia food pod on 12th and SE Hawthorne (which also has Potato Champion and Perreira Creperie, as seen in an episode of “Portlandia”) . I forgot to mention Darlene that the pies have letters stamped on them to differentiate the flavors. We were given a card with heating directions and the “codes” since we took ours to go. It’s so interesting how much Social Media buzz Papa Luna’s has generated. I saw their ad on San Diego City Beat and was like “Whoa! Empanadas!” Next day (Friday) I was there, did my 4square and two people from the Twitter world chimed in and asked about Papa Luna’s…and now your blog post. Good for them, I ate the puerco adobado and sweet potato fries…loved them! Simon from Papa Luna’s here. First off, thanks for coming in and the excellent blog post, very flattering and we’re excited you enjoyed your experience. In regards to your critiques, changes on all those things are in the works. Our empanada making process is constantly evolving (when I think about where we are now vs. when we first opened, i’m amazed!). I’ll be the first to admit the cheese empanada didn’t turn out quite as I had hoped, that said, it’s an empanada of the month so will go on hiatus for a few months while we work it out and to make space for new options. Crab and Andouille Gumbo is in the process of a rework, I invite you back in to try the re-creation on the house. – Community Space- For now (until summer, maybe indefinitely) We are closed on Tuesdays and look to use the space for projects close to our customer’s and community’s hearts. Ideas floated are empanada making classes, cooking for kids, and pop-up kitchens. Email me (simon@papalunas.com) or stop in and share any ideas you have! 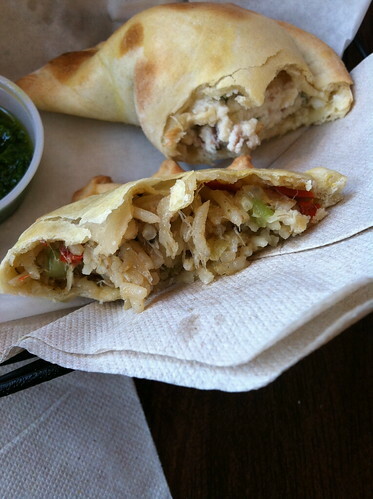 Thanks again for the review and patronage, we’re excited to share the empanada (r)evolution with all of you! 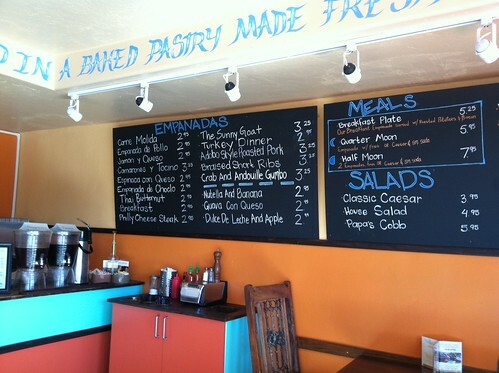 The only empanada place I’ve been to is the one down in Bonita – but this place looks awesome, too! I totally dig empanadas so I’m happy to see another empanada place up and running. Nice to see the owner is working on different options to make happier customers! More dessert empanadas, too, please! Went here again today and YES! You can order them either fried or baked! Good to know! Did you like them better when they were fried? Yes, way better fried! They didn’t have that thick, doughey (is that even a word) feel!